ADALBALD, a Duke of Douai, and courtier in the courts of both King Dagobert I (r. 623–634) and King Clovis II (r. 639–657), St. Adalbald was a son of St. Gertrude the Elder (6th December). He and his wife St. Rictrudis (12th May) dedicated their time and wealth to various religious undertakings, as well as care of those in want. In addition, SS. 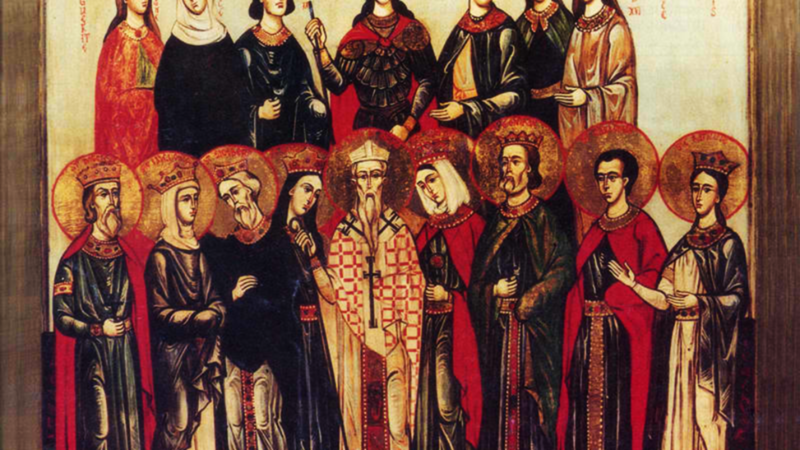 Rictrudis and Adalbald raised four children, all of whom became saints: SS. Maurontius (9th January), Clotsindis (30th June), Eusebia (16th March), and Adalsindis (3rd May). Whilst traveling, St. Adalbald was murdered by an in-law acting on behalf of St. Rictrudis' family (circa 645–651), who had always disapproved of their marriage, and good works. ADELOGA (HADELOGA), a daughter of Charles Martel, who renounced the world, and was the founding-Abbess of Kitzingen Abbey in Franconia (present-day Bavaria in Germany). St. Adeloga reposed circa 745. APRONIAN, was a Roman executioner who, during the Diocletianic Persecution (circa 304), escorted St. Sininius (29th May) to the tribunal run by the Prefect Laudieius. St. Apronian was offered the chance to renounce Christ and thus be spared death. However, he made a statement of faith that was so passionate that St. Apronian converted on the spot, and was martyred shortly after St. Sininius. COLUMBANUS, an Irishman and abbot who fled with his community fled the Viking raids, and settled in Ghent, Flanders. For the last two years of his life, St. Columbanus lived as a hermit near the church of Saint-Bavo in Ghent. St. Columbanus reposed in 959. FEOCK, (Date Uncertain), aside from a church dedicated to her in Cornwall, her Life is unknown to us. It is possible she was an immigrant from Ireland, and there are some who believe that St. Feock is a variant of Fiacca, a Confessor, friend of St. Patrick (17th March), though this is unlikely. Lastly, there are those who identify St. Feock with St. Vouga (15th June) of Brittany. FLOSCULUS (FLOU), (Fifth Century?) the thirteenth Bishop of Orléans. A letter from St. Sidonius Apollinaris (21st August) to St. Flosculus leads contemporary scholars to believe he was living circa 480. Nothing, save knowledge of the existence of a cultus, is known of his life. LAURENCE of CANTERBURY, second Archbishop of Canterbury he was one of the forty monks sent by Pope St. Gregory the Dialogist (3rd September) with St. Augustine (27th May) to convert the Anglo-Saxons. According to St. Bede the Venerable (25th May), St. Augustine sent St. Laurence back to the Pope to report on the success of converting King Æthelberht of Kent, and to carry a letter with questions for the Pope. He returned with additional monks, as well as Pope St. Gregory the Dialogist’s (3rd September) replies to St. Augustine’s questions, a document commonly known as the Libellus responsionum , that St. Bede the Venerable (25th May) incorporated in his Historia ecclesiastica gentis Anglorum . 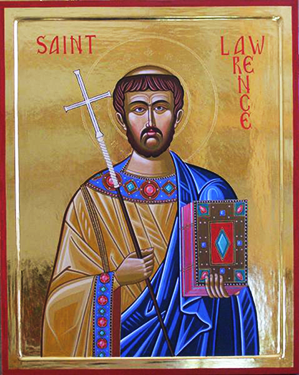 St. Laurence was consecrated the second Archbishop of Canterbury in 604, by St. Augustine, in order to assure succession, and guided the young Church skilfully, and successfully, through the crisis that followed the death of King Æthelbert. St. Laurence reposed in 619, and was succeeded by St. Mellitus (24th April). MARQUARD, a monk at New Corvey Abbey in present-day North Rhine-Westphalia, Germany. St. Marquard was consecrated Bishop of Hildesheim in 874, and served that See until his martyrdom, with others at Ebsdorf (vide infra) in 880. MARTYRS of EBSDORF, In 880 members of the army of King Louis III, led by Duke St. Bruno of Ebsdorf, were trapped in the ice and snow at the Battle of Lüneburg Heath (Battle of Ebstorf) against pagan Norse invaders. All, including St. Bruno, St. Marquard of Hildesheim (vide supra) and St. Theodoric of Ninden (vide infra), a dozen members of the nobility, along with innumerable unnamed foot soldiers were slain and subsequently venerated as martyrs. THEODORIC, a Bishop of Ninden counted amongst the Martyrs of Ebsdorf (vide supra) (†880).